Israel says the military has delivered eight trucks full of humanitarian aid and medical supplies to the Gaza Strip, where Israeli troops firing from across the border killed nearly 60 Palestinians at mass border protests on Monday. Cogat, the military body for Palestinian civilian affairs, said Tuesday it has transferred 53 tons of medical equipment to Gaza this week, including medical fluids, bandages and physical therapy treadmills. It says fuel will be distributed later. The trucks entered Tuesday, as medical facilities in Gaza were struggling to treat hundreds of people wounded by Israeli fire the day before. Monday was the bloodiest day in Gaza since the 2014 war between Israel and Gaza’s Hamas rulers. Dozens of people were killed and 2,700 were wounded. The protests were directed at a crippling blockade imposed by Israel and Egypt after the Islamic militant group seized power in Gaza in 2007. Israel says it is defending its border and accuses Hamas of trying to carry out attacks under the cover of the protests. The Palestinian envoy to Washington has been recalled to Ramallah in protest over the U.S. relocating its embassy to Jerusalem. Husam Zomlot confirmed to The Associated Press on Tuesday that he is returning home. Palestinian Foreign Minister Riad Malki said President Mahmoud Abbas instructed Zomlot to return to Ramallah. The U.S relocated its embassy from Tel Aviv to Jerusalem on Monday. The fate of Jerusalem is a deeply emotional issue at the heart of the Israel-Palestinian conflict. The Palestinians claim east Jerusalem for their future capital. They are outraged by the move and say it invalidates Washington’s role as an impartial peace broker. Israel has asked the Turkish Consul General in Jerusalem to temporarily leave the country. The move Tuesday came after the Turkish foreign ministry temporarily expelled the Israeli ambassador to protest the use of deadly force on the Gaza border and the U.S. decision to relocate its embassy to Jerusalem. The Israeli and Palestinian ambassadors at the United Nations are accusing each other’s countries of violating international law a day after Israeli troops killed more than 50 Palestinians and wounded over 2,700 at a mass protest at the Gaza border. The envoys spoke at a U.N. Security Council meeting Tuesday. It ended without any joint statement or action. Israel says it is defending its border and accuses Gaza’s Hamas rulers of trying to carry out attacks under the cover of the protests. Palestinian health officials in the Gaza Strip say two Palestinians have been killed by Israeli gunfire during protests near the border. The shootings come amid growing international uproar over the Israeli military’s use of deadly force against unarmed protesters. Over 100 Palestinians have been killed and hundreds wounded by live fire in a series of weekly protests led by the ruling Hamas militant group. On Monday alone, nearly 60 people were killed in the deadliest day of violence since a 2014 war. Palestinians resumed their protests Tuesday, but only dozens turned out. The Health Ministry says the deaths occurred in separate incidents in central Gaza. Israel says it is defending its border and accuses Hamas of using demonstrations as cover to carry out attacks against Israeli targets. United Nations Secretary-General Antonio Guterres says that Monday’s killing of more than 50 people on the Gaza border shows the need for a political solution to the conflict. Chancellor Angela Merkel has told Israeli Prime Minister Benjamin Netanyahu that Germany feels bound by the nuclear deal with Iran — as long as Tehran upholds its side of the bargain. U.S. President Donald Trump announced last week that Washington was withdrawing from the 2015 accord, citing as one reason alleged evidence presented by Israel of Iran’s nuclear program. In a phone call Tuesday with Netanyahu, Merkel said Germany too has concerns about Iran’s ballistic missile program and its destabilizing role in the region. She condemned recent Iranian attacks against Israeli positions on the Golan Heights. According to her office, she added that the right to peaceful protest and assembly in Gaza shouldn’t be abused to provoke unrest. U.S. Ambassador Nikki Haley is telling the U.N. Security Council that no member “would act with more restraint than Israel has” in its confrontation with Palestinians at the Gaza border. Haley says the violence that left 59 Palestinians dead Monday had nothing to do with the opening of a U.S. embassy in contested Jerusalem. She says the Islamic militant Hamas extremist that rules Gaza has been inciting violence there for years. Palestinians condemned the embassy opening as taking Israel’s side in their conflict. Kuwaiti Ambassador Mansour Al-Otaibi says Israel was violating international law and that the council needs to step in to protect unarmed Palestinians. Kuwait called for the session after Monday’s deadly clash between Israeli troops and Palestinians marching on the Gaza. Thousands of people have gathered in Lebanon’s Beaufort castle near the border with Israel to mark the Jewish state’s creation 70 years ago that led to the displacement of hundreds of thousands of Palestinians from their homes. The mostly Lebanese and Palestinians waved Palestinian flags during the ceremony outside the castle that was occupied by Israel until it withdrew in 2000 from southern Lebanon. Arabs are marking the 70th anniversary of what Palestinians call their “nakba,” or catastrophe — the uprooting of hundreds of thousands in the Mideast war over Israel’s 1948 creation. They flew green, white, red and black balloons — the colors of the Palestinian flag — toward the Israel border. Tuesday’s protest came a day after Israeli troops killed nearly 60 people in Gaza in bloodiest day since a 2014 war with Israel. In addition, more than 2,700 people were hurt, among them 1,360 by gunshots. Israel’s military says at least 24 of the Palestinians killed in a mass march a day earlier at the Gaza border were militants. It said Tuesday that the gunmen had a “documented terror background” and were members of the Islamic militant Hamas and the Islamic Jihad militant group. It said eight Hamas operatives In one incident attempted to breach the border fence using Palestinian civilians as cover. It said they threw grenades and shot at troops who had rushed to the scene, and that its troops returned fire and killed the militants. The military said its forces prevented a “significant” attack, but did not specify how many of those it killed were armed. It released photos of grenades and a gun it said were from the scene. Israeli forces killed 59 Palestinians in Monday’s clashes. A U.N. Security Council meeting on the violence along the border between Israel and Gaza has begun with a moment of silence for the more than 50 Palestinians killed by Israeli forces on Monday, the bloodiest day there since a 2014 war. Poland’s ambassador, Joanna Wronecka, called for the gesture of remembrance in her role as current council president. Kuwait called for the session after Monday’s killings. Israel said its troops were defending its border. The Palestinian envoy wants the council to condemn the killings. Israel’s ambassador is calling for condemnation of Hamas, the Islamic militant group that rules the coastal strip and led the protests. South African Nobel Peace Prize winner Archbishop Desmond Tutu has condemned the killing of Palestinians by Israeli troops as a massacre. The retired Anglican archbishop, 86, issued a statement from his Cape Town home on Tuesday about the killing of Palestinian protesters. Tutu, who has been treated for prostate cancer and has been hospitalized several times for infections, occasionally issues statements on issues he believes are important. Last year he criticized President Donald Trump’s decision to officially recognize Jerusalem as Israel’s capital. Tutu said that “God was weeping” at Trump’s decision. He also took offense to the Frankel’s comment that Israeli soldiers had to act before their were casualties on their side. “There were two statements I could not accept: One on proportionality of force by saying they could not wait for Israeli casualties — there were none,” he said. Turkey’s official news agency says the country has asked Israel’s ambassador to temporarily leave Turkey. The ministry summoned the ambassador to protest Israel’s use of deadly force on Palestinians and the U.S. decision to relocate its embassy there to contested Jerusalem. Turkey has also called home its ambassadors to Washington and Tel Aviv for consultations. Turkey says it is prepared to take in wounded Palestinians after Israeli fire killed dozens and wounded hundreds during Monday’s Gaza border protests. Speaking Tuesday, Health Minister Ahmet Demircan said Turkey’s emergency agency and the military had prepared an “air bridge” to transport wounded Gazans and were waiting for negotiations to conclude. He says the wounded are at high risk due to insufficient health care in Gaza, which has been under an Israeli-Egyptian blockade for more than 10 years. Demircan’s comments were carried by Turkey’s official Anadolu news agency. Turkey has strongly condemned the U.S. decision to relocate its embassy to Jerusalem and Israel’s use of deadly force on Palestinians protesting the move. The new embassy was inaugurated on Monday. Germany says it supports calls for an independent investigation into the killing of dozens of Palestinians by Israeli forces during protests in Gaza. Seibert told reporters in Berlin on Tuesday that the right to peaceful protest should exist in Gaza too, but blamed the Palestinian group Hamas for firing up tensions on the day the United States unveiled its new embassy in Jerusalem. The U.N. Security Council is planning to meet Tuesday to discuss the violence. Germany isn’t currently a member, but it is seeking a seat in the coming term. Belgium is calling for an international investigation into Monday’s escalation in violence along the Gaza border, where Israeli soldiers shot and killed more than 50 Palestinians during mass protests. Prime Minister Charles Michel on Tuesday linked the violence on the border with the Trump administration’s decision to relocate the U.S. Embassy to contested Jerusalem despite international and Palestinian protests. Michel said the violence and killings would be moved onto the calendar of the European Union summit in Sofia on Wednesday and Thursday. He said he was outraged by the violence, especially in contrast with the opening of the U.S. Embassy in Jerusalem on the same day. The U.N. human rights office says Israel has repeatedly violated international norms by using deadly live fire to repel protesters from its border with Gaza, suggesting its forces should arrest anyone who reaches the fence. Office spokesman Rupert Colville reiterated calls for an independent investigation into Israel’s use of lethal force in border demonstrations in recent weeks, including the deadliest incident on Monday, when dozens were killed. South Africa has recalled its ambassador to Israel, and its international relations minister Lindiwe Sisulu is condemning Israeli troops’ use of deadly force against Palestinians. Pro-Palestinian marches were set to take place Tuesday in Cape Town, in front of the U.S. consulate in Johannesburg and in the capital Pretoria amid some calls for the South African government to expel Israel’s ambassador. Sisulu said she had phoned U.S. Secretary of State Mike Pompeo to voice South Africa’s unhappiness with the violence. Gaza health officials are casting doubt on initial claims that a 9-month-old baby died from Israeli tear gas fired during mass protests on the Gaza border with Israel. A medical doctor said Tuesday that the baby, Layla Ghandour, had a pre-existing medical condition and that he did not believe her death was caused by tear gas. He spoke on condition of anonymity because of he was not allowed to disclose medical information to the media. Layla’s family claimed Tuesday that the baby had ended up in the area of the protest as a result of a mix-up. The Gaza Health Ministry initially counted her among several dozen Palestinians killed Monday. A Gaza human rights group, Al Mezan, says it is looking into the circumstances of the infant’s death. Ireland’s foreign ministry has summoned the Israeli ambassador to express “shock and dismay” over the latest bloodshed in the Gaza Strip and is calling for an independent investigation. Gaza health officials say Israeli forces killed 58 Palestinians, most by gunfire, and injured more than 2,700 in border protests Monday. Ireland says that during Tuesday’s meeting with the Israeli ambassador, it also said it was “very disturbed” by injuries to more than 200 health workers in Gaza. “The ambassador has been informed of Irish demands for an independent international investigation into yesterday’s deaths lead by the U.N.,” a statement said. Palestinians are clashing with Israeli troops in the West Bank a day after deadly clashes killed dozens in the Gaza Strip. Thick black smoke billowed from burning tires as Palestinians threw stones at Israeli troops, who responded with tear gas. About 200 Palestinians were protesting in the biblical city of Bethlehem while another 100 were demonstrating in the Palestinian city of Ramallah. Palestinians are marking the anniversary Tuesday of what they call their “nakba,” or catastrophe, a reference to the uprooting of hundreds of thousands who fled or were expelled during the 1948 war surrounding Israel’s creation. Israeli forces killed 58 Palestinians in Monday’s clashes in Gaza. Organizers say the weekly protests are meant to bust a decade-old blockade on the territory. Israel says Hamas is using the demonstrations as cover to carry out attacks. Palestinians in the West Bank city of Ramallah have marked the 70th anniversary of their mass displacement with a 70-second siren. People stood at attention and traffic stopped in parts of the city Tuesday to mark the moment, though in some areas, the sirens appeared to malfunction and could barely be heard. Palestinians mark May 15 as their “nakba,” or catastrophe, when hundreds of thousands of people either fled or were expelled from their homes. This year, the occasion was especially sad for Palestinians, coming a day after the U.S. opened its new embassy to Israel in Jerusalem and 58 Palestinians were killed in Gaza during protests along the Israeli border. The World Health Organization says the number of protesters wounded in border clashes with Israel was “very overwhelming” for Gaza’s health system. Citing figures from the Health Ministry and a group of aid agencies, WHO official Mahmoud Daher told The Associated Press Tuesday that 2,771 people were wounded in Monday’s unrest. Of those, 1,360 were wounded by live fire, 400 from shrapnel and 980 from gas inhalation. He said the majority of those wounded by live fire were struck in their lower limbs. Daher says that nearly 1,800 of the wounded sought hospital care, putting additional pressure on Gaza’s already stressed hospitals, which endure equipment and medicine shortages and face power cuts like the rest of the territory. Turkey has lowered flags to half-mast to mark three days of mourning for the Palestinians killed and wounded in the Gaza border protest. The gesture comes as the government invites members of the Organization of Islamic Cooperation for an extraordinary session Friday. Speaking late Monday, the Turkish government’s spokesman announced the official mourning period after Israeli forces killed 58 Palestinians, most by gunfire, as they protested the Gaza blockade and the relocation of the U.S. embassy to Jerusalem. China is calling on Israel to exercise restraint along its border with Gaza a day after 58 Palestinians were killed in a protest. Foreign Ministry spokesman Lu Kang said Tuesday that China “opposes violent acts targeting innocent people” and urges all sides to avoid escalating tensions. Lu said China believes in a two-state resolution and that the status of Jerusalem should be resolved through dialogue between Palestinians and Israelis in accordance with relevant U.N. resolutions. Tens of thousands of Palestinians have rallied in recent weeks near Israel’s border fence to protest a blockade of Gaza and the move of the U.S. Embassy to contested Jerusalem. China has long championed the Palestinian cause while also maintaining close economic, diplomatic and military relations with Israel. The government of Muslim-majority Malaysia says the relocation of the U.S. Embassy in Israel to Jerusalem will jeopardize efforts toward finding a comprehensive and lasting solution to the Palestinian-Israel conflict. Its foreign ministry said in a statement that security in the region will be undermined and sentiments inflamed, hampering any future peace negotiations. 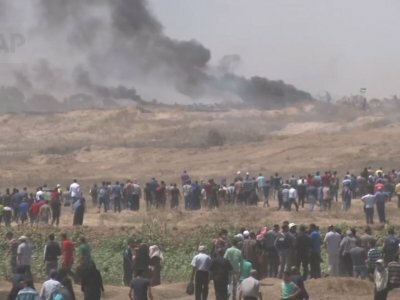 The Israeli military says its aircraft have struck a number of Hamas targets in the Gaza Strip in response to mass border protests. The military says Tuesday it struck 11 “terror targets” in a Hamas military compound. Tanks targeted another two Hamas posts in the Gaza Strip. The military says that protesters used 10 explosive devices and firebombs against troops and that shots were fired at soldiers positioned along the border. While there was no breach of the border fence, the military says many protesters attempted to enter Israel. Palestinians will be burying their dead Tuesday after 58 people were killed by Israel during Gaza border protests. Khaled Batch, the head of the grassroots organizing committee of the protests, says Tuesday will be a day for funerals, suggesting there were no plans for border marches. Israeli media reported some tents where protesters have been gathering have been taken down at the border. Tuesday is what Palestinians call their “nakba” anniversary, or catastrophe marking the creation of Israel 70 years ago. Gaza health officials say the Palestinian death toll from a day of mass border protests Monday has risen to 58, including 57 people killed by Israeli fire and a baby who died from tear gas inhalation.